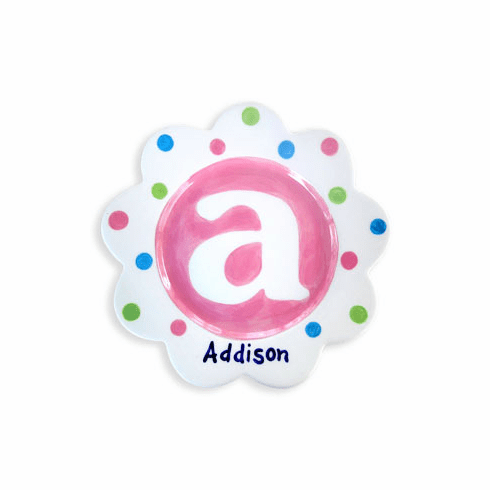 This plate features a large monogram in the middle, scalloped edges and is personalize with the child's name at the bottom. The pink, blue and green polka dots will look great in any little girl's room. This plate would even make a great wall decoration. Each and every plate is hand-painted and signed by artist Kathleen Virtue. Her trademark is the wonderful detail on each plate. Kathleen says, "Every plate has a story, just like all of us!". Plate comes in two sizes 8.5" and 10.5". Custom made.